Steel Casters for Self-Dumping Hoppers. Transport loads with portable hoppers. When casters are ordered with hopper, quick-install caster pads are factory-welded to the base of the hopper. The casters are then shipped uninstalled to prevent freight damage. Casters not ordered with the hopper will need to be welded in place by the customer. 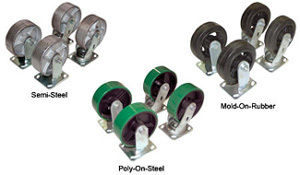 The 1/4 and 1/2 cubic yard "H" series hoppers only include three casters - two rigid and one swivel. The maximum weight capacity is the lowest weight capacity of either the hopper or the caster. Specs: quantity 4, capacity 6,000 lbs. Available in 6"x2 1/2".